Welcome to stop 4 of 35 in the Lily Pad Cards blog hop! This blog hop starts today and will feature seven blogs per day when it culminates on Friday, April 1, with the grand opening of Lily Pad Cards. Although Lily Pad doesn’t officially bloom until April 1, 2011, you’ll be able to see a new sneak peek every day until then. And you’ll definitely want to drop by because there are three prize packages with a total retail value of over $300 - including a $100 gift certificate to a very popular online store! Go here for specific prize details and contest rules. Papers: Bazzill, October Afternoon & Sofies Dream. 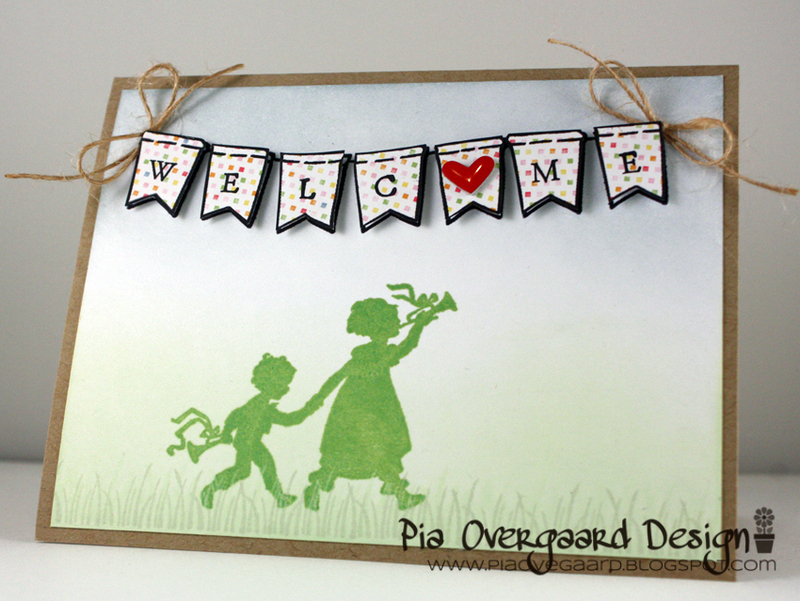 And here is my second card for you - with a welcoming banner and the darling silhouettes. Thanks for stopping by! The next stop on the hop is the super talented Nina Brackett’s blog. If you hit a bad link, you can always go to Lily Pad Cards and click on the next link in the hop. LOVE your cards, Pia! Just BRILLIANT of you to use a blue frog. I had a total 'wish I'd thought of that' moment. :) The second is just so sweet and celebratory! these are terrific! love how the sentiment follows the "hops"
these are wonderful! love the personal touch of the cardmaker sentiment on the first one! Pia they are both adorable! How cute is this blue frog! Thank so much for sharing your talent on our blog hop! So adorable, Pia! I'm with Sarah-I wish I had thought of that cutie blue frog! PERFECT, Pia! What a great idea to use a blue frog, and of course, the celebrating children is another great idea for our hop! Oh Pia, your cards are fab-u-lous!! Love your little blue frog, it looks like we are going to be chasing him all week! Sweet welcome banner too, love it! OMG..the blue frog is just too cute! Love the hops sentiment too! You're so creative Pia! These Cards are adorable Pia! Lovely card!!! I love the froggie, he is sooo adorable! And the second is super sweet. Oh, this is adorable!!! Love how you did the frog hopping. Wonderful cards, Pia! The perfect way to celebrate this exciting new venture! Love your blue frog! Love love love these cards..love the blue froggie and love the silhouette card.. Thank you for such a sweet welcome!! Both cards are fabulous--love the blue frog! Love both cards! You are so clever to layer your banner! Super cute cards, Pia! I adore how you did the sentiment on the fun one with the blue frog! And the kids with the banner is so sweet too! Wonderful welcome cards! Both of these cards are amazing!!! Pia this is just too cute! Love the hopping frog and his special message! The dancing silhouette is another celebration card and perfect for the hop! Beautiful cards! Adorable adorable adorable froggy card!!!!!! It really showcases this celebration! And I am swooning over your banner on the 2nd one!! Oh my goodness, Pia these are soooo cute!! Love the jumping forg and the banners on the 2nd card! Hey sweetie - what a surpric to see you here on the blog hop - congratulations! Cute cards.... that frog is awesome - love it! Two great cards, love the frog!!! Sooooo cute Pia....love both of your fun cards! These are both beautiful, and that little frog is just over the top adorable! Love your cards, Pia! Thanks for the inspiration - that blue frog is soooooooo sweet! Absolutely stunning and very creative cards Pia! I adore your blue frog! LOVE your cards Pia! That frog one is especially sweet! Love that blue frog, Pia! And those sweet banner letters. You are rocking the pond! Wow Pia, Love your cards. And that frog is gorgeous in blue. Pia, adore both of your cards. They are so beautiful. Love the froggie... just adorable. Love the sentiment... thanks for the inspiration. Cute Cute cards! Adorable frog! Your cards are beautiful I especially love your blue frog! These are both so sweet, but I can't get over that blue froggy! So cute. Great cards Pia - I especially love the blue frog one - perfect for Lily Pad !!!! That blue frog is too cute! And the 2nd card is cute & pretty! I like your cards very much! I have a special feeling for the second one! Have a nice day! Wow!!!!!!! Love both cards, Pia! How fabulous to have these two cards for this special occasion! You rock! I am a sucker for little froggies & that guy is just so cute! Love the silhouette on the second card, so adorable. Love both your cards Pia, great paperpieced frog!! I love those cards.. the blue frog it too cute. I must get that LF set. WOW Pia, these cards are awesome!! Love the new look on your blog too! Hi Pia! Love your new blog and your wonderful cards! So honored to be hopping with you today...Hugs!! These are fantastic! I like how you just used part of the kids stamp. Wow Pia! Both your cards are absolutely beautiful! I love both of your cards. Your blue frog is adorable! Pia your froggie card is too cute! Adorable cards! Love each and every one! So cute! Love the banner and the blue frog! These are gorgeous Pia! I love that frog! Oh My Goodness...LOVE YOUR CARDS. The colors...everything is wonderful!!!! What a cute frog! Great card. Margaret K.
Love these!! The frog is great!! I love how you incorporated a frog into your design! Again you´ve made 2 fabulous cards!! They are both really stunning! Love them. those 2 cards are so super cute! love the frog! Pia, I love both of your cards...but that little frog is just the cutest thing!! Awesome cards Pia. Love them both. Love both card creations, but that hopping frog is just TOO CUTE! Both are soo sweet. I love the jumping frog and the banner with the silhouettes is just beautiful. It's an honor to be hopping along with you, Pia. These are both fab... I certainly feel welcome! Enjoying the hop! The frog and banner is adorable. Just love that blue frog! You are all making very curious about the happening on friday! Wonderful cards Pia, such fun cards and full of spirit! Love them both! Love your cards, very cute! TFS! so cute! Love that frog and the sentiment! These cards are great. I just love the little froggy. TFS. Both card are pure sweetness Pia!!! Thanks for the welcome cards! That froggie is so cute! Both cards are just adorable! I especially love the children silhouettes! Awesomely creative welcome cards, Pia! Love the blue frog! Oh, Pia. I adore your style you really do know how to put a card together. I LOVE both your amazing cards. I love both cards; but that frog is just the cutest thing! Both of your cards are wonderful! I love the blue frog with the big eyeballs! And your sentiment is ultra-cool! Great layout altogether! Thank you for sharing. I so love your little blue frog on the first card! The second card is really adorable with the children running to welcome everyone. Loving the kraft! And I love the banner-I just got that stamp set and now I'm extra excited to use it more! I'm going to hop along now! So cute. That frog is just awesome. Happy Hopping! your frog card is way tooo cute!! love it!! love both cards!! The blue frog is just too cute. Oh my goodness...your cards are soooooooo cute!!! Love, love the sentiment and the way you used the image on the second card!! Both cards are so great and personal. Love cards that use kraft paper! Very cute cards!! love the banner and the super cute blue frog!! absolutely amazing cards, Pia!!!! so fun and creative!! love love them both!! These cards are great! The blue frog is too cute. Love those two cards - totally blue frog is wonderful. such beautiful cards Pia Love how you used the blue frog. Great card! I love the frog. Love your cards Pia, that frog just made me smile big and the musical walk is so adorable..love them both..hugs! perfect Pia! the blue frog is perfect! that little tiny frog could not be any cuter than he is. lovely cards. LOve that little blue frog and both cards are darling! You give such a warm welcome- good luck to your new blog! What a sweet little frog! Great cards!! Both cards are gorgeous, thank you so much for the doble welcoming! What a totally fun and cute design! You're so creative! Love your style! Love the clean design of both cards, yet so adorable! Pia, both cards are great, they both seem CAS, but are so great with the little details!! Great job!! You're first card made me smile. 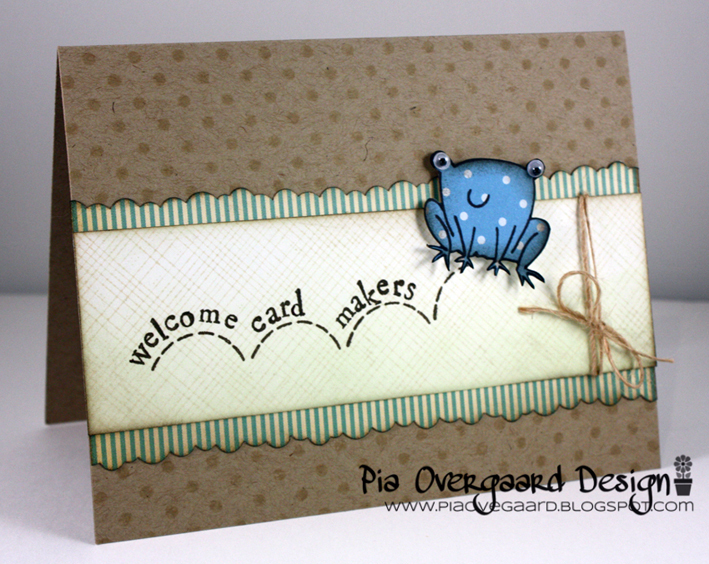 Darling blue frog card, Pia, and I love the Lawn Fawn banner card too! Both of your cards are darling, sweet. Your frog is just adorable! Adoree both of your cards! Thanks for sharing. 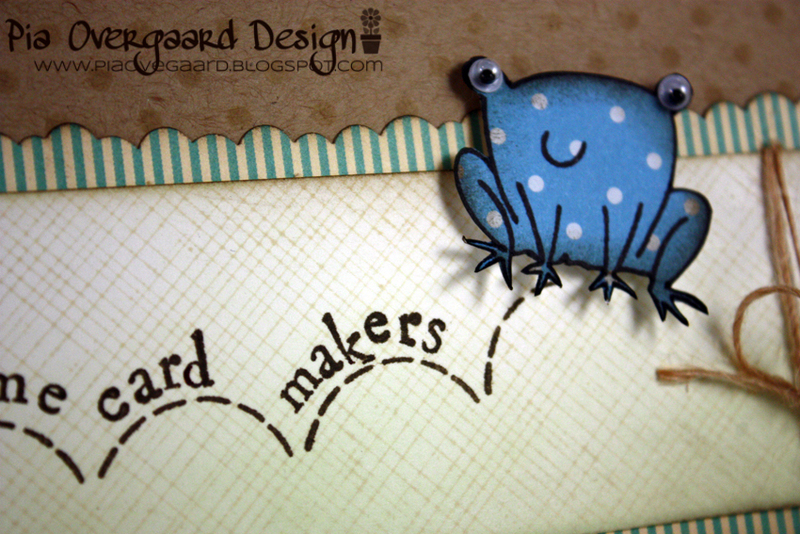 Your cards are adorable.... love the blue frog! Love both of your awesome cards!!! Great sentiment for the HOP! I just love your cards! The silhouette on the second card is adorable. Love the hopping frog on the first card. Okay, both cards are just too cute, but that little blue frog is too adorable! So simple but so cute, Love the little frog. pia! i love your style! adorable cards! love that cute blue frog!! The blue frog made me laugh! Great way to start the day! THanks! Great cards for this event. Love the first one welcoming us cardmakers. Jeg er bare helt vild med den lille frø ha ha ha . Hodt at se, at en dansker kan være med også, det er vi ikke forvænt med. Dit kort er bare rigtig sødt. Love your Hopping & children welcome cards! I love the banner on the second one! GOSH, det er nogle flotte kort. Jeg kan slet ikke stå for det første med frøen. Flot med teksten over sprigbuerne. The eye are perfect for this card. Your cards are BEAUTIFUL and that Frog...he is TOO CUTE!!! Brilliant idea on the blue frog, just in theme with Lily Pad Cards! The other card is so heart warming with the red heart on the banner! Love the blue frog! so cute! Both of your cards are so darling and creative, what a fun hop. cute cards! i especially LOVE the froggy! Pia your amazing! Love your work in our HA group and it doesn't surprise me to see that these cards here today are outstanding as well. Big congrats on your being a part of this hopping place.